Wow, impressive. 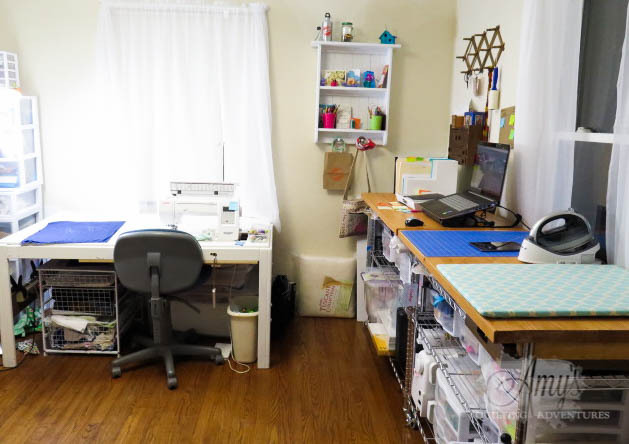 Your sewing room looks soooo organized. Do you used that sewing board with steam also? 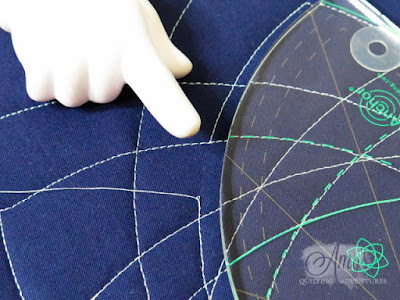 One of my goals for 2016 is to sew every day even for 30 minutes. It makes a huge difference in projects completed and I want many project completed. I guess maybe I am being self indulgent because the goal of 30 minutes means that I satisfy my own creative needs in my happy place. I haven't yet, but I plan to use it with steam. I've done so with my other boards. I think we need to be in our happy place regularly(whatever it is) in order to be our best for others. The link for your bullet journal does not work. Can you please update as I am very interested in this. Thanks! Ha! I didn't work because I forgot to put the link in. Let's here if for my organization skillz! It's fixed and I added another link too. Amy, have you heard of anyone having success with the Janome adjustable ruler foot (low shank) working on other brands of sewing machines? I have an Hausquavara Viking Designer Diamond Deluxe and really would like to have an adjustable ruler foot, and they don't make one. When you have a little cottage and the front door opens into the studio, you learn to be organized! All my lists are endless. That's why I used to stick to index cards or post it notes----I was constrained by the space to not overdo the number of tasks! I too am reorganizing. My husband repurposed our old TV cabinet by adding shelves to the inside for fabric storage. The shelves ar nice and deep, perfect for storing my stash. Like falling dominoes, that new cabinet has led to a total reorganization of my workroom. 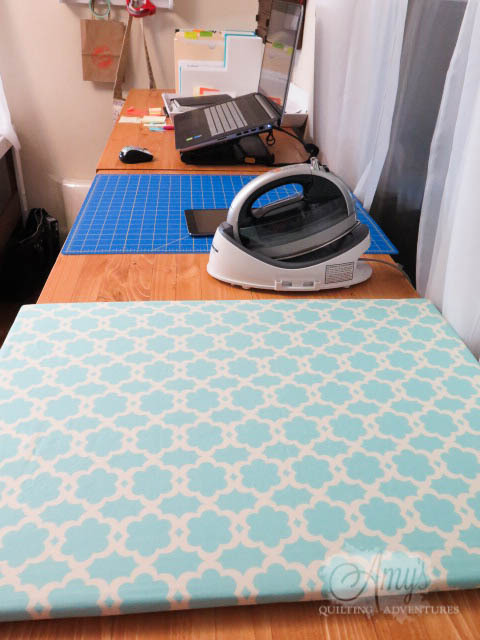 When I was done I wanted an ironing station to the right of my sewing machine but could not find one the right size. Thanks so much for sharing yours! I will be buying a piece of plywood tomorrow to make myself a copy! Did you staple the turquoise and white cover to the board as well as the other layes? Good for you! The turquoise cover isn't stapled down, rather I made a casing for it and threaded elastic through it. This way I can easily wash it when it gets a bit grubby. What brand of tables are you using for your cutting/ironing surface? They look to be counter-height. Love your quilting cave, especially the window view by the sewing machine! They are counter top height, but they're not actual tables. You can read about them here: http://www.freemotionquiltingadventures.com/2015/08/reorganizing-studio-part-2.html I love them! Yes, the window are nice! I was trying to convince myself to move my studio into a different room but realized I'd lose my nice natural light. Your studio looks great! What type of iron do you use? And does it have auto shut off? I don't like that feature and it seems hard to find a good iron without it. Susan, that's a Panasonic cordless iron. I'm still trying to decide if I like it. Love that it's cordless. It does have auto shut off which does drive me batty. Turn it on, do something else while it heats, come back, turn it back on, repeat.